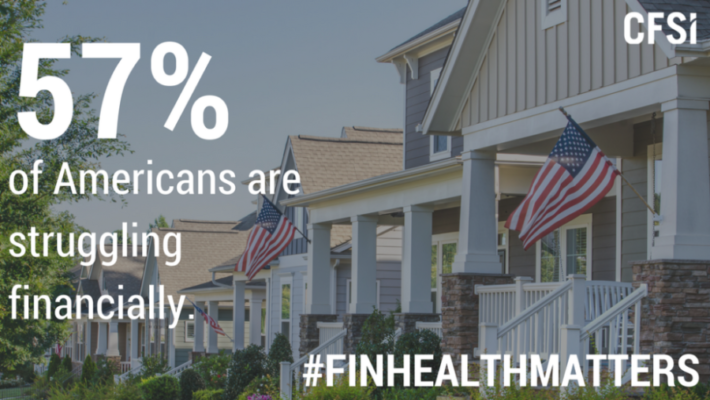 Today is #FinHealthMatters Day – a day designed to draw attention to the 57% of Americans who are struggling financially, ignite conversations about what financial health means, and inspire collective action to improve financial health. What do we mean by financial health and financial capability? It is a holistic approach to what is required to achieve financial wellbeing. It starts with learning the fundamentals of financial literacy. The building blocks of literacy are often taught in school through personal finance courses. But, financial capability goes beyond literacy. Acting on financial knowledge is also critical. Which is why the workplace, is an important institution for building financial capability. From cashing (or depositing) one’s first paycheck, to putting money away for retirement, the workplace is considered a key moment in financial capability building. Financial capability is ever more important to successfully navigate today’s complex financial environment. To further help American build financial capability, we should work to enhance other opportunity points at the intersection of financial knowledge and action. Tax time presents an additional window of opportunity for helping individuals build financial health. The annual tax preparation process is a habitual financial check-up – the only one for many taxpayers. The process can empower tax filers to reflect on the past year and set-goals for the coming year. The tax administration ecosystem can help taxpayers take charge of their financial well-being. Many of our nation’s social policy goals aimed at economic opportunity and financial security are administered through the tax code. For example, there are dedications and credits for low-income workers with children, post-secondary education and training, retirement saving, and homeownership. Financial literacy is essential to understand and plan for the economic incentives that are driven through our tax code. Notwithstanding the need to simplify the tax code so average taxpayers can more easily understand their eligibility for benefits, the tax administration ecosystem can help taxpayers understand and plan. Most taxpayer get an annual tax refund, and for many low-income households the refund typically amounts to a sizeable portion of their overall income. Thus, decisions about refund spending and saving are important considerations for financial security. The tax administration ecosystem can help taxpayers leverage their refunds for financial well-being. No single educational approach, just-in-time financial guidance, or FinTech innovation will be the complete solution for financial health. Rather a holistic combination of financial literacy programs, starting with youth, and mechanisms to help Americans navigate the complex financial marketplace is needed. Which is why, since its formation in 2003, the Financial Literacy Education Commission (FLEC) has been working to develop and coordinate a national strategy for financial education and capability. The tax administration ecosystem has an important role to play in this coordinated strategy and we at Intuit look forward to help in leveraging the tax time window of opportunity for financial health. Let us know how what Financial Health means to you at #FinHealthMatters.